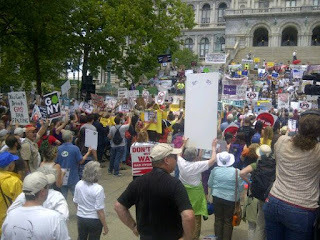 The march stretched all the way around the state capitol in Albany - thousands gathered to protest fracking and promote renewable energy. More and more, we see groups opposing extreme energy such as fracking, tar sands or coal exports, forming alliances with community renewables. Inspiring speakers including Arun Gandhi and Sandra Steingraber pledged nonviolent civil disobedience if Governor Cuomo lets hydraulic fracturing into the state of New York. Stanford professor Mark Jacobson presented a plan to take New York state to 100% renewable energy by 2050. (While we at the Solar Gardens Institute believe 100% renewable energy is possible, we would like to see a plan a bit different from Dr. Jacobson's - one less reliant on concentrated solar and offshore wind and the transmission lines these imply. We would prefer to see small-scale community owned solar PV and storage, turning each distribution feeder into a microgrid that can resist disruptions like Hurricane Sandy.) No more would folks like Ray Kemble of Dimock PA have to deal with water contamination resulting from fracking, and the climate would have a chance to stabilize. The slate that nearly clobbered us! Moments after the rally ended we got a taste of what we are fighting for, as sudden 60 mph winds followed by heavy rain announced the arrival of a derecho-like storm. Such weather is getting all the more frequent since the loss of much of the Arctic ice cap. Ray and I were running back to our cars when the wind blew a piece off slate off the roof of the capitol building, nearly knocking Ray's hat off. A few inches closer and he could have been killed! It hit the ground and broke in two - I got one piece and Ray got the other. 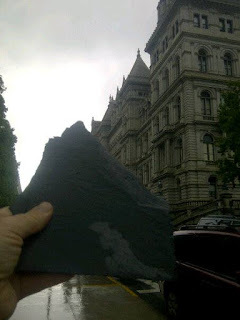 Now slate is metamorphic shale - we couldn't help but note that the climate-fueled storm had fracked the state capitol! People are making the connection everywhere - solar can create the jobs we need without the need to crack the bedrock beneath our feet and contaminate our water supply. Community owned renewables can bring the benefits of clean energy to all of us, while protecting the climate. Bring it to the leaders in your state, your country: Stop fracking, go solar now!